What makes up our public discourse? We seem to want to know everything that is going on around us, and we love to form opinions on a myriad of topics: baseball statistics; where to get the best pizza; strategies for the next election. But it doesn’t stop there; we also actively seek out the opinion of others. In fact, it could be said that our world is divided into two camps: those who agree with us, and those who don’t. Said another way, we receive information from the world around us—what we read, who we talk to, and what is projected by the ubiquitous media—and then choose what to believe, what to let in, what warrants a reaction. 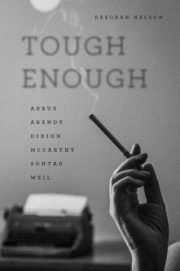 In Tough Enough, Deborah Nelson examines the work of six women who were known for their strong opinions: Diane Arbus; Hannah Arendt; Joan Didion; Mary McCarthy; and Simone Weil. Nelson maintains that these women can be studied as a group, although their ideas are in no way similar, or even compatible. Their importance derives not only from the contents of their books, magazine articles, or art exhibits, but also from the tone in which they were presented. Collectively, these artists did not depend on any kind of sentimentality to explicate their opinions, even when their subjects were earthshakingly tragic. They all believed that as soon as emotions were introduced in public discourse, even in art, they obscure the clear light of understanding. According to Nelson, this clear-sightedness kept these six very public figures grounded in reality. Indeed, the first sentence of her introduction proclaims: “This is a book on women writers, intellectuals, and artists who argued passionately for the aesthetic, political, and moral obligation to face panful reality unsentimentally.” But what is this reality? Even when writing about the twentieth century, it should be impossible to use this term without definition. After all, the philosophical ramifications behind quantum mechanics were already being explored in the post-World War II era. The Heisenberg Uncertainty Principle, introduced in 1927, underlies today’s understanding that reality is in the eye of the beholder, that no one person or group possesses an ultimate, unchanging certainty. Therefore, an event such as the Holocaust should not be seen as monolithic and has as many stories as it had participants—and all of these stories are real, even if we do not want to hear some of them (Eichmann’s, for instance, as told by Hannah Arendt). Joan Didion didn’t make her husband come back from the dead, or cure her sick daughter, but writing The Year of Magical Thinking did make it possible for her to imagine a world in which these things were happening. Diane Arbus, by her choice of subject and atmosphere, made visible new realities. Susan Sontag writing about her illness and Mary McCarthy writing about her upbringing introduced new ways of thinking about experiences common to most people. The true contribution of these six women was not a lack of emotion, but rather their reticence to rely on sentiment in their work. They were cognizant of their very public roles and could have given in to the easy play on gut reaction that usually prevails in public argument. There is a strong moral component to much of their collective work—a morality that suggests we ought to see that is deeper than any conclusions based on surface emotions, quick reactions that overwhelm critical thought. “It seems almost unsporting to revisit the misogynist reactions to a woman intellectual in the 1950s, so obvious are they and so unsurprising,” Nelson points out, yet we would do a disservice to ourselves to discount the role that gender plays in this debate. Nelson writes without academic jargon, yet she uses the critical sources focused on a point of view that is primarily feminist, and sensitive to the plight of underrepresented minority populations. She does not present her subjects in any historical context, and therefore their roles as female artists, and their successes in a time when the majority male voice was codified as a unified worldview, are obscured. By concentrating on analyzing the work of these six women, however, she highlights their importance—not as popular tastemakers, embroiled in issues of their time, but as public philosophers, eager to point a way to a deeper understanding of our shared world. In this way, she helps to bring her subjects forward in time. The women profiled in this book developed the ability to engage in theorical discourse in the wake of such horrors as the Holocaust, not to mention personal illness and death, and that is why their work continues to resonate; a Sontag or a McCarthy defines a subject long after their first introduction. These women are passionate, and able to express their particular passions without cant. Some of the very way we think is due to the concepts they developed. It is a wonderful thing to read such a cogent and thought-provoking analysis of their work.